Look at who joins JJ for her 13 Things this week! 1. The 23rd Annual Glass Craft & Bead Expo at the South Point this weekend will feature nearly 160 booths, local and international artists, a variety of classes and live demonstrations. An auction on Sunday will benefit Opportunity Village. 2. The Mojave Spring Fling at Spring Mountain Ranch State Park will feature nature-themed crafts, games, activities, live-animal appearances, and guided walks. Bring a picnic and enjoy an afternoon of outdoor fun at this family-friendly event. 3. The reggae band Fortunate Youth performs inside Vinyl at the Hard Rock Hotel on April 1. Fortunate Youth is known for its messages of peace, love and unity. Special guests include Josh Heinrichs & Skillinjah with For Peace Band and Iya Terra. 4. Country star Dwight Yoakam performs in the Star of the Desert Arena at Buffalo Bill's on April 1. Some of his hit songs include "Miner's Prayer," "Fast As You," "A Thousand Miles From Nowhere" and the number one hit "Guitars, Cadillacs." Dwight's newest album, "Swimmin' Pools, Movie Stars," was released in 2016. 5. The legendary Jimmy Buffet & The Coral Reefer Band performs April 1 at MGM Grand. Buffet rose to fame with his songs that often feature an "island escapism" lifestyle. His biggest hits include "Margaritaville" and "Cheeseburger in Paradise." 6. Country singer Chris Janson has written singles for Tim McGraw and many others. He also recorded an album titled "Buy Me A Boat" in early 2015. He performs April 1 at Green Valley Ranch. 7. The Old School Reunion at Boulder Station on April 2 is a classic car event for pre-1986 import cars including Alfa, Audi, Acura, BMW, Datsun, Honda, Porsche, Isuzu, Subaru, MG, Toyota, Nissan, Mazda, Mercedes, Volkswagen, Volvo and more. 8. Las Vegas Strip headliner and comedian Carrot Top will be the special guest on the next edition of Conversations with Norm (Norm Clarke) at The Smith Center for the Performing Arts on April 2. The informal interview is hosted by Channel 13's Shawn Tempesta. 9. The Mob Museum in downtown Las Vegas will host a special presentation titled "Media and The Mob in Las Vegas" on April 4. The multi-media presentation will bring together veteran journalists and lawyers who were on the front lines of the fight between the mob and law enforcement in the '70s and '80s. 10. Robert Irvine Live is happening April 6 at the Tropicana hotel-casino. The event will feature never-before-seen interviews, cooking challenges, a question-and-answer session and audience participation. The English celebrity chef has appeared on and hosted a variety of Food Network programs. 11. The Mockstrocity Tour will stop at the House of Blues at Mandalay Bay on April 6. Heavy metal bands include Mac Sabbath, Metalachi and Okilly Dokilly. 18 and over admitted. 12. Latin superstar Ricky Martin performs April 6 through 8 in the Park Theater at the Monte Carlo. Martin rose to fame in the '80s in the boy band named Menudo. Hits include "Livin' la Vida Loca" and "She Bangs." 13. Experience comedy and magic with "Jarrett & Raja: Magician vs Maestro" at Hooters. The pair has been featured on "Shark Tank" and "America's Got Talent." Show also feature GRAMMY Award-winning music director Will Champlin and singer Megan Ruger from "The Voice." 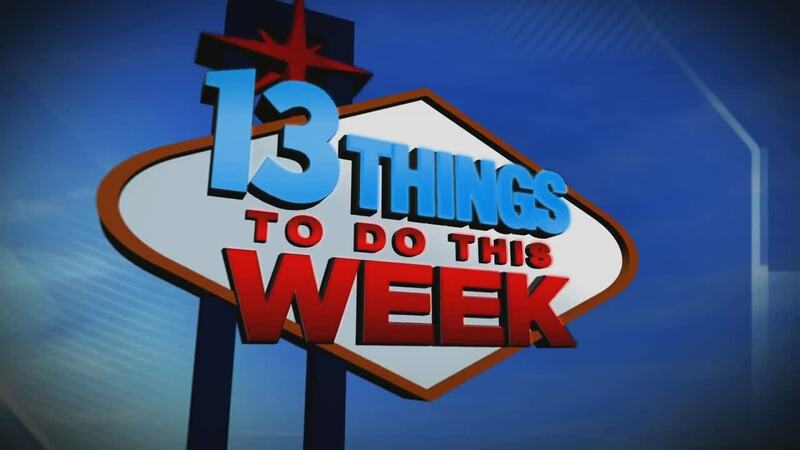 If you would like to submit an item for 13 Things, send an email to joyce.lupiani@ktnv.com.